For politics in Indonesia, see Politics of Indonesia. On 30 September 1965, six of the military's most senior officers were killed in an action (generally labelled an "attempted coup") by the so-called 30 September Movement, a group from within the armed forces. Within a few hours, Major General Suharto mobilised forces under his command and took control of Jakarta. Anti-communists, initially following the army's lead, went on a violent purge of communists throughout the country, killing an estimated half million people and destroying the PKI, which was officially blamed for the crisis. The Post-Suharto era in Indonesia began with the fall of Suharto in 1998 during which Indonesia has been in a period of transition, an era known in Indonesia as Reformasi (English: Reform). 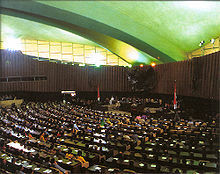 A more open and liberal political-social environment ensued following the resignation of authoritarian President Suharto, ending the three decades of the New Order period. The DPR, which is the premier legislative institution, originally included 462 members elected through a mixed proportional/district representational system and thirty-eight appointed members of the armed forces (TNI) and police (POLRI). 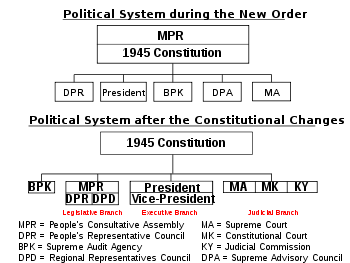 TNI/POLRI representation in the DPR and MPR ended in 2004. Societal group representation in the MPR was eliminated in 2004 through further constitutional change. A general election in June 1999 produced the first freely elected national, provincial and regional parliaments in over forty years. In October 1999 the MPR elected a compromise candidate, Abdurrahman Wahid, as the country's fourth president, and Megawati Sukarnoputri — a daughter of Sukarno, the country's first president — as the vice-president. Megawati's PDI-P party had won the largest share of the vote (34%) in the general election, while Golkar, the dominant party during the Soeharto era, came in second (22%). Several other, mostly Islamic parties won shares large enough to be seated in the DPR. Further democratic elections took place in 2004 and 2009. The president and vice-president are selected by vote of the citizens for five-year terms. Prior to 2004, they were chosen by People's Consultative Assembly. The last election was held 9 July 2014. The President of Indonesia is directly elected for a maximum of two five-year terms, and is the head of state, commander-in-chief of Indonesian armed forces and responsible for domestic governance and policy-making and foreign affairs. The president appoints a cabinet, members of which do not have to be elected members of the legislature. ^ Stop talk of KKN Archived 26 October 2014 at the Wayback Machine. The Jakarta Post (24 August 2001). ^ "Indonesia's military: Business as usual". 16 August 2002.